Don't you sometimes just like to imagine that you are on MasterChef and that you are creating this wonderful and spectacular arrays of delicious food? I know I do, always in fact. How I wish I could sous-vide the watermelon like Andrew or knocking up some crème de menthe caviar using spherification technique like Tom. Which explains why every now and then, I like to set myself a challenge and try to come up with dishes using different flavours and influences. I came across some beautiful looking artichokes and fennels in Berwick street market, London yesterday and I thought this will be great for dinner. 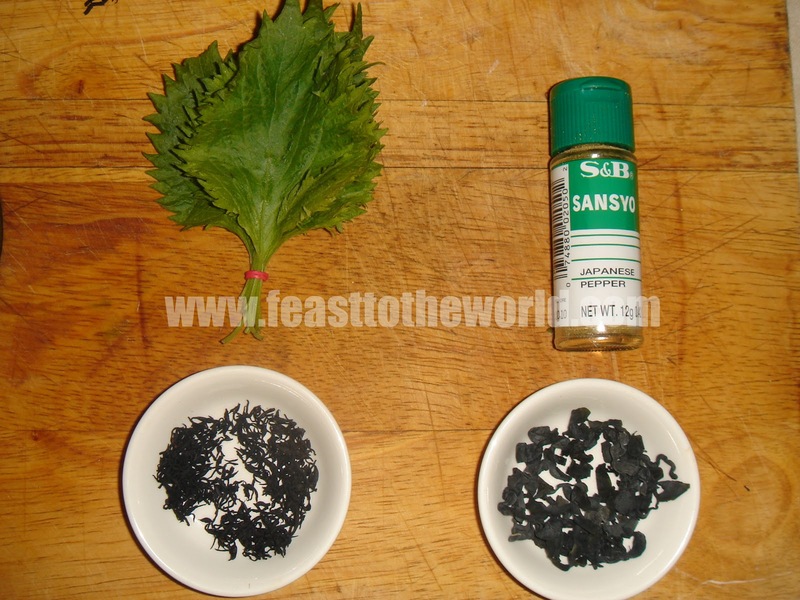 I really want to create something yummy with some of my current favourite Japanese ingredients such as Shiso/Perilla leaves and Sansho pepper. 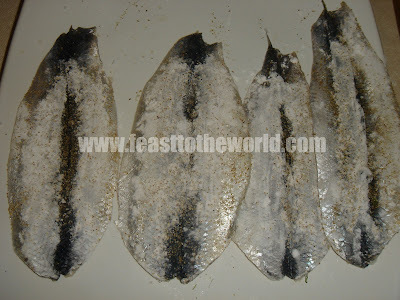 And that's when I came across some fresh herrings. I love oily fish, they have such intense flavours and are highly underrated and cheap. The idea of pan frying them into love crispiness skin and tender flaky flesh just seems perfect for me. Just to give it more flavour, I have decided to give it a light dusting of sansho pepper. I like this pepper because it is very similar to sichuan peppercorns which I love. You get an almost lemon-like overtone follow by a numbing and tingling sensation which is altogether quite intriguing. Now to accompany that, I have made a salad using the artichoke and fennel. 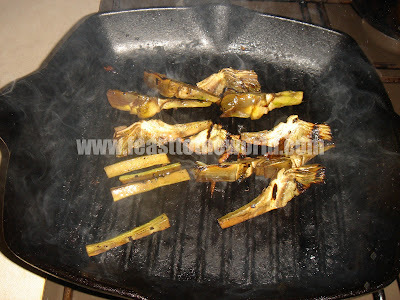 I like the idea of serving the fennel raw, crunchy with a hint of aniseed; but the artichoke, I want to bring out more of the hidden sweetness so I sliced them into chunk and grill them on a griddle pan. I had some hijiki and wakame seaweeds in the pantry, so those were thrown in to add a delicate sea freshness into the salad. To follow through with the Japanese influences so far, I have also made a dressing using the aromatic yuzu juice and the salty miso paste along with mirin, rice vinegar and some dashi. It was delicious. 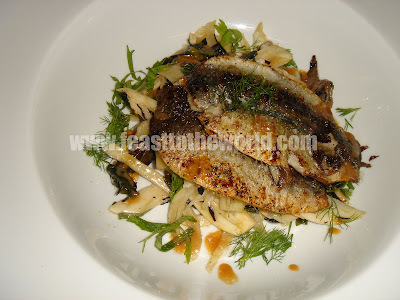 Rich, tangy and all the flavours stood up really well against the fishy herrings. And to finish everything off, I sliced up some shiso leaves finely and garnished the dish with these which not only gave it the most refreshing peppery taste but also a beautiful colour to the finished dish. Well, it might not demand the technical abilities of a MasterChef creation, but to me, it's a mighty fine dish nonetheless. 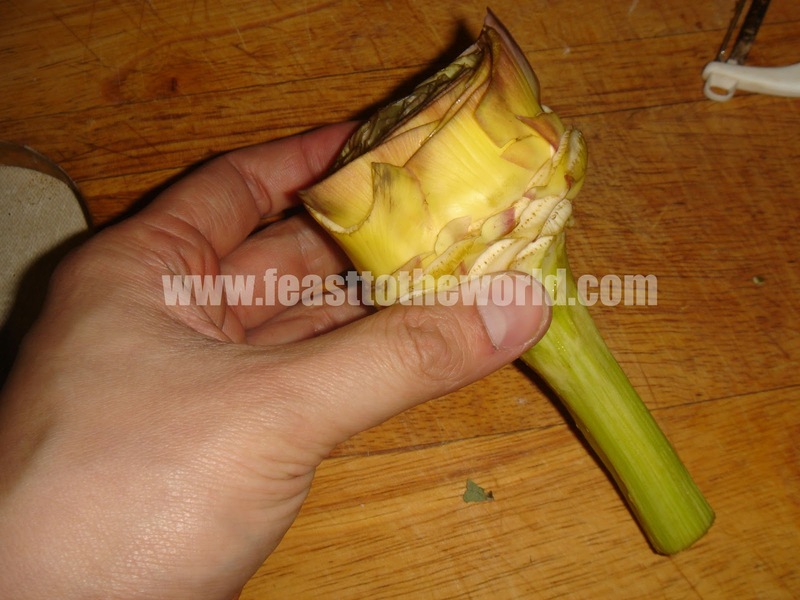 To prepare the artichoke. 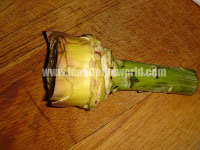 Cut away the woody part of the stalk leaving about 4-5cm. Remove the tough outer leaves. 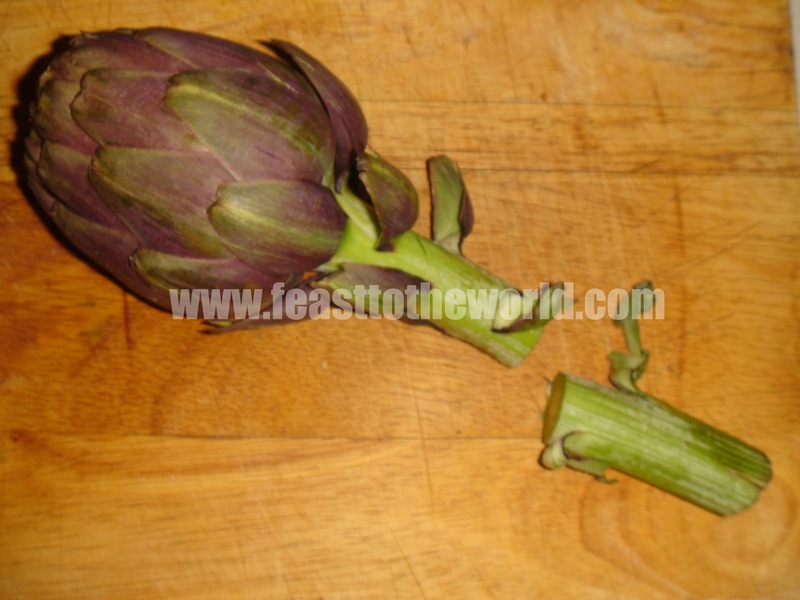 Cut across the top and scoop out the middle 'choke', the purplish furry centre. 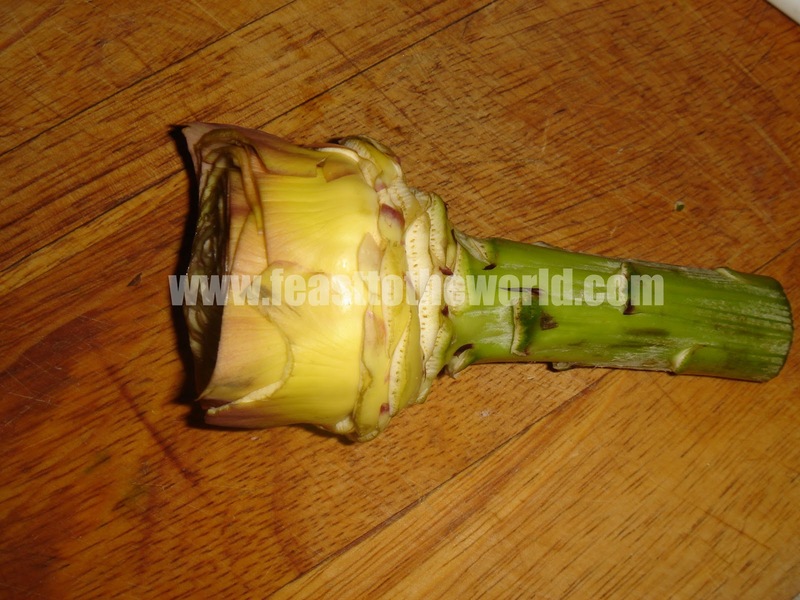 Peel the tough outer layer of the remaining stalk. 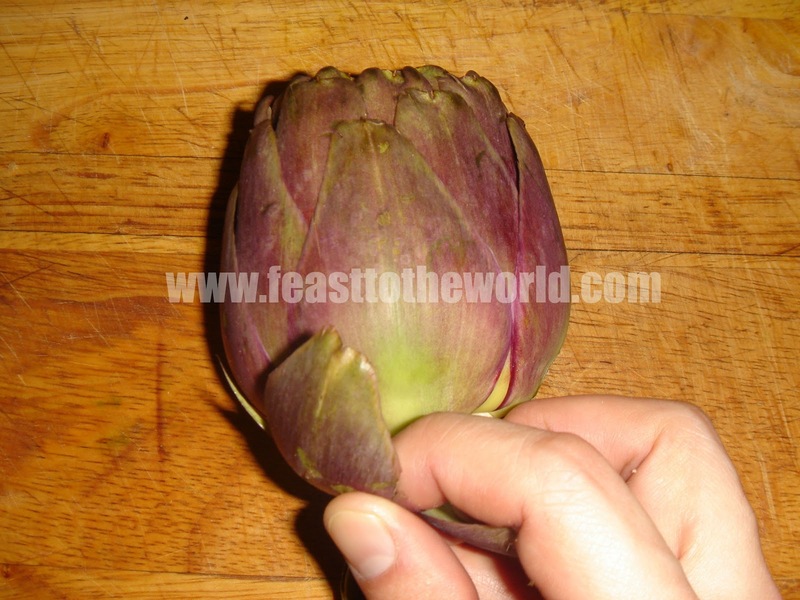 Immediately submerge the prepared artichoke into a bowl of water with half a lemon to stop it from oxidising. Fill a pan with water and bring to a boil. Add the prepared artichokes and cook for 10-12 minutes, until tender. Drain and leave to cool. Once cool enough to handle, cut into eighth lengthwise. Toss them lightly in oil and grill them on a hot griddle pan for 2 minutes on each side, until golden and slightly charred. Set aside to cool. In a pan, add the miso, mirin, dashi and sugar and heat up slightly until the sugar has dissolved. Remove from heat and allow it to cool. Once cooled, add the yuzu juice and oil and whisk to mix thoroughly. Heat a large frying pan over medium heat. 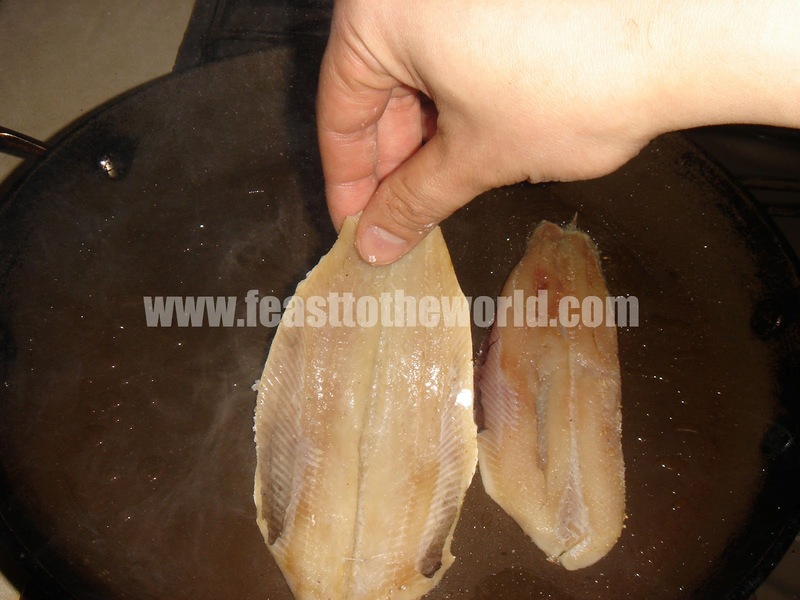 Lightly coat the skin of the fillet with sansho pepper and plain flour. Fry skin side down for 2 minutes, until golden and crispy. Turn and cook the other side for another 2-3 minutes, until cook through. Remove and drain on kitchen paper. In a large bowl, mix the seaweeds, fennels and roasted artichokes together with the 3 tablespoon of the yuzu miso dressing. 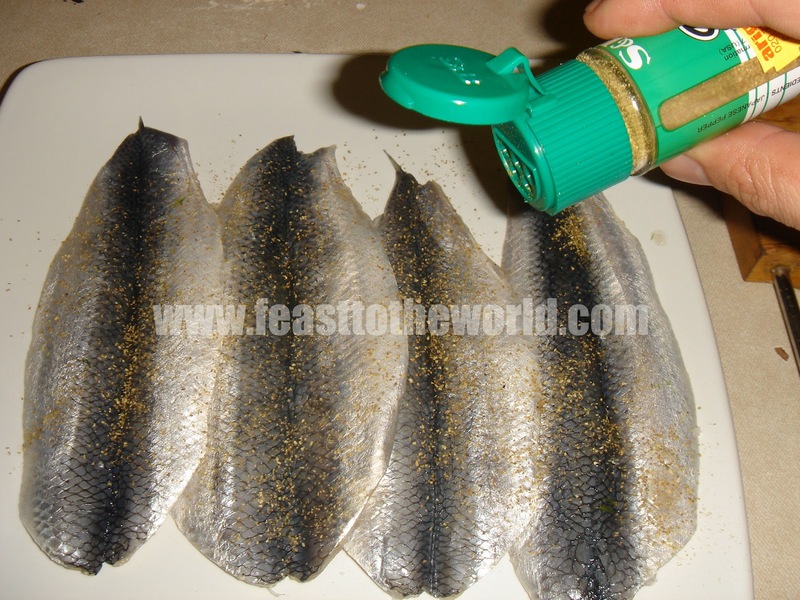 To serve, pile the salad on a clean plate and top with the herrings. Garnish with some of the reserved fennel herby top and shiso leaves and season with a pinch of salt. Drizzle over any remaining dressing.